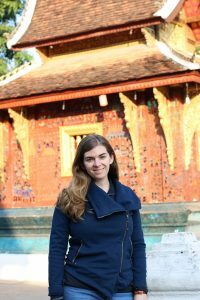 Laos was the country I’d been waiting to visit for my entire life. Tourism only started there in the late 1990s, and this is a good thing for many reasons. But one of the best parts about traveling to a country just opening to the world is that I had no preconceived notions about it. No stock images in my head of what I’d see. Even after researching the trip, I still didn’t know what to expect. But even if I had had expectations, Laos would have exceeded them every time. 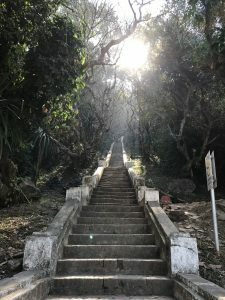 Here’s a Laos travel itinerary with impressions and stories and pictures from the land of a million elephants. 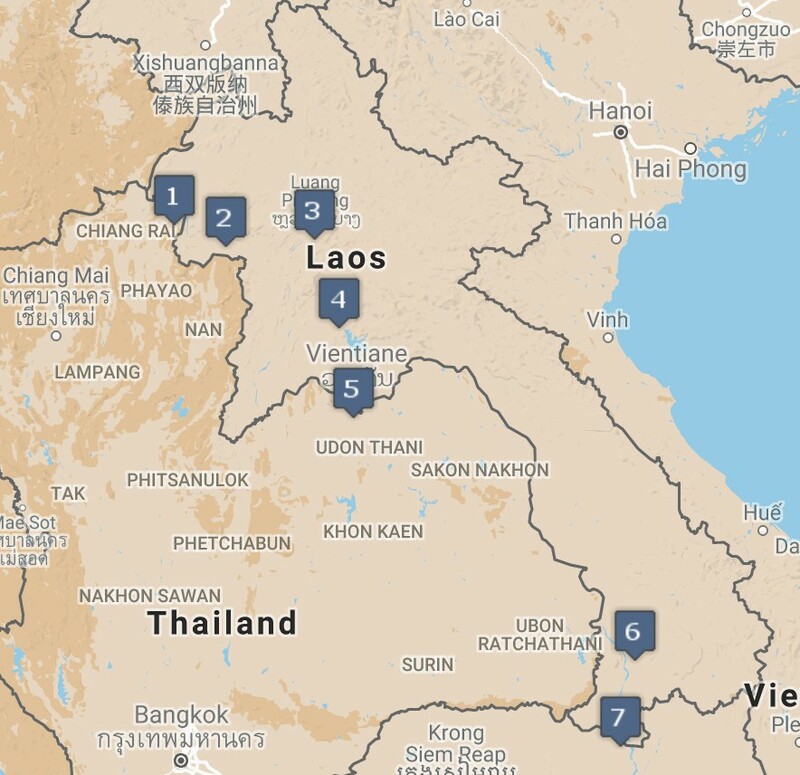 A map of Laos and travel itinerary from north to south. From Chiang Mai, we took a bus on a winding mountain road past Chiang Rai, to the Thai border crossing Chiang Khong. 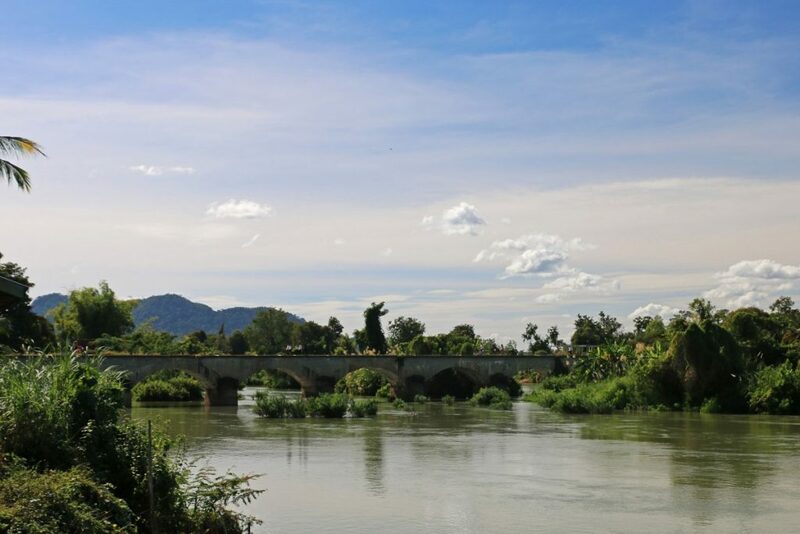 It’s a laid-back border town on the Mekong with a relaxed, friendly vibe. We stayed here just one night, but we could’ve lazed around for a few more. If only for another sunrise over the Mekong. Sunrise in Chiang Khong, Thailand, overlooking the Mekong into Laos. On the bus, we met a Thai-American couple, who were also staying at our lovely riverfront hotel. Our new friends invited us to lunch, the Thai woman explaining, rather impatiently, “I need some spicy food right NOW.” A woman, and an entire country, after my own heart. At the cafe, I asked her to tell the cook to please make my food as hot as hers. The cook looked at me skeptically – Westerners are notorious in Thailand for sending back their food for being too spicy. She watched nervously as I took my first bite: the spice was just right and I nodded enthusiastically. She laughed and laughed and laughed as she watched me eat like a Thai. The next day, we crossed the Chiang Khong border crossing into Huay Xai, Laos. The border crossing from Chiang Khong, Thailand, to Huay Xa, Laos. As I was waiting for a ride to the Mekong slow boats, I sat on the curb outside immigration, reading Roberto Bolano’s 2666. At nearly 1000 pages, it was too heavy a book for such a long trip and too dark a tale, but it was what I had. 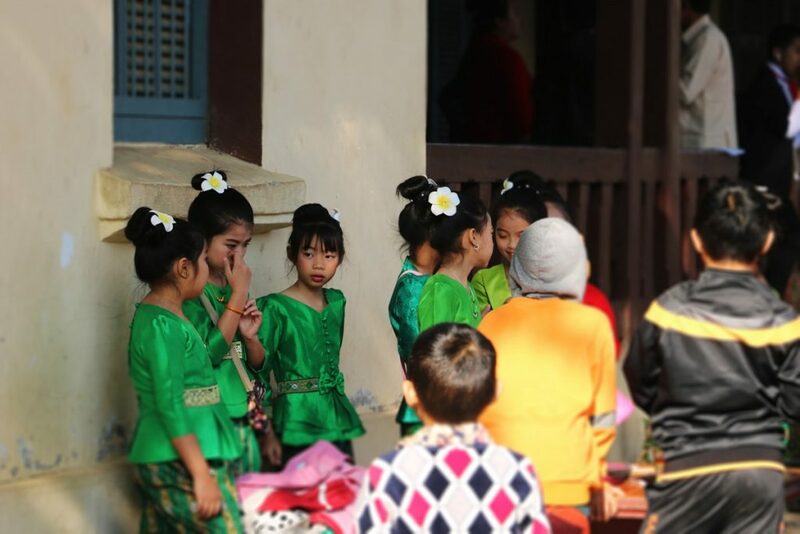 A trio of Lao women dressed in traditional wrap-around skirts came over and stood right in front of me, a troop of children in tow. Their kids giggled, pointing at the huge book in my lap. Me and my ways were as curious to them as theirs to me. Their curiosity felt so good-willed and honest. I only hoped my own interest would also be perceived so too. This must be what it’s like to travel in a country that hasn’t been taken over by mass tourism, which commodifies and distorts the natural curiosity we have lives for different than our own. 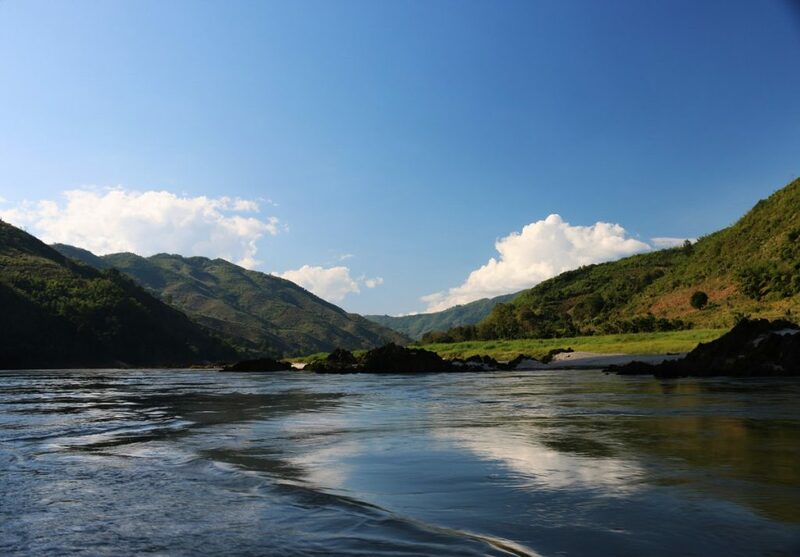 The steady flow of the Mekong, a big, muddy, slow-moving river, sets the contemplative pace of life in Laos. It only seemed appropriate to travel Laos the old fashioned way – the Mekong was, until quite recently, one of the main ways in or out of this country of impenetrable jungles and mountains. 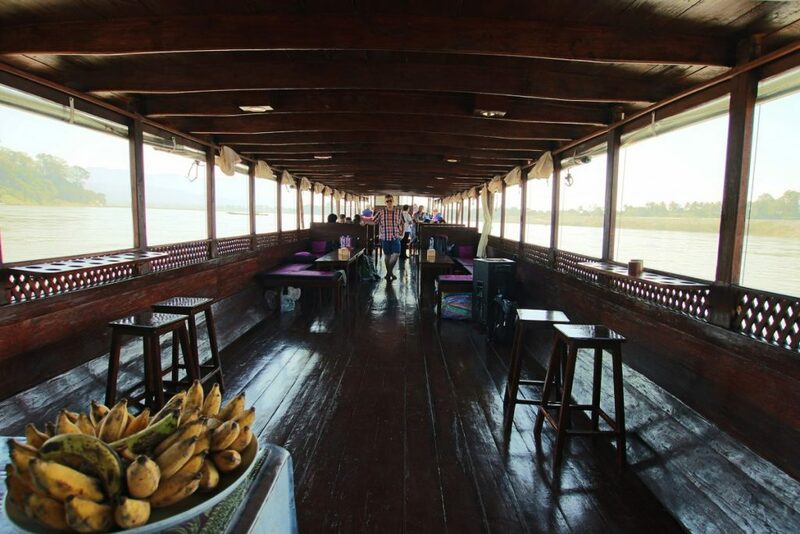 The two-day Mekong cruise to Luang Prabang on a traditional wooden slow boat was one of the best things I did in Laos. It was a quiet few days on the river. Watching the river weave its serpentine way through the mountains, I felt my thoughts slowly begin to filter down and settle on some distant bottom. I didn’t even know my mind had been so churned up. Our slow boat on the Mekong in Laos. 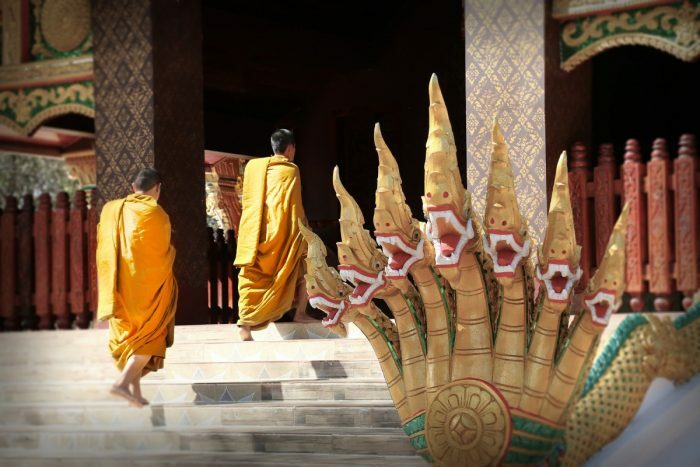 We traveled to Laos with Shompoo Cruises. From the deck of a Mekong slow boat in Laos, it’s easy to see why Laos is so often described as forgotten, timeless, peaceful. 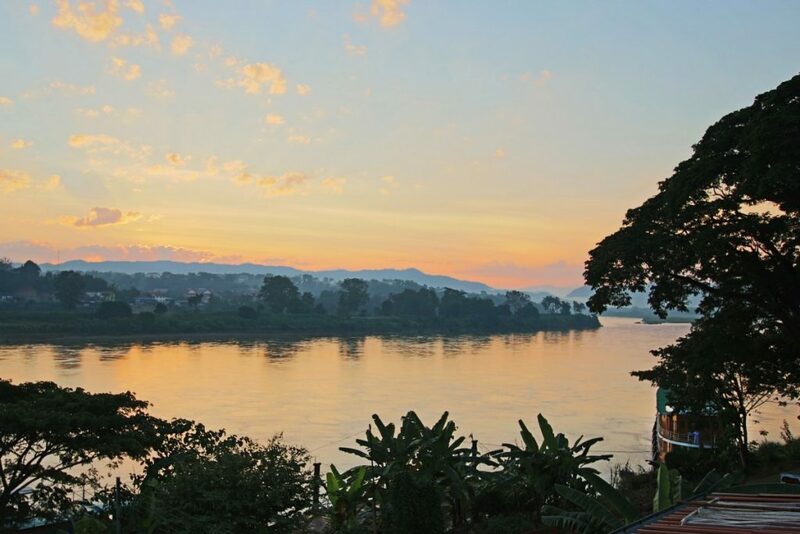 Sunset over the Mekong River in Pakbeng, Laos. 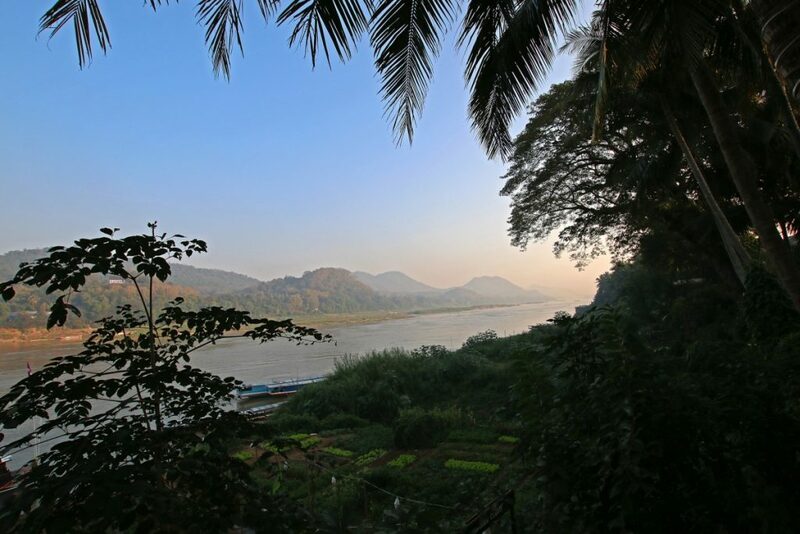 Sunrise over the Mekong in Luang Prabang, Laos. Another magical city that feels like it’s chosen to reveal itself to you. 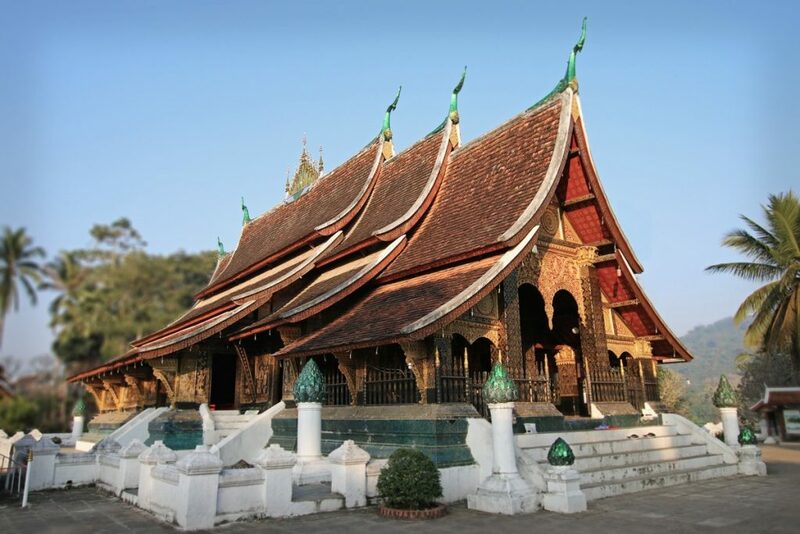 Luang Prabang is a mountain city of gilded Buddhist temples and French colonial buildings built on the banks of the Mekong. The two architectural styles come together more cohesively than the politics of the colonial history would suggest. Posing in front of the bejeweled mosaic facade of Wat Xieng Thong, Luang Prabang. Empty streets shaded with palms. A royal palace and a temple at the top of a long hike up a mountain. Cafes serving coffee thickened with condensed milk and sugar. Kids all dressed up for a graduation ceremony at a French-language school. At daybreak, monks clothed in saffron robes walk in solemn lines, collecting alms from the community. Temples flood with light as caretakers sweep the grounds. At night, a street market where women from neighboring hill tribes sell gorgeous textiles for a song. Outside of Luang Prabang, a sanctuary for moon bears rescued from bear bile farms, where bears are held captive in tiny “extraction” cages and hooked up to machines that drain bile from their livers until they die. After that, their bodies are harvested for their fur or paws (bear paws are apparently a delicacy). It’s a $2 billion dollar industry for traditional medicine in Southeast Asia. Past the bear sanctuary, we followed a path along otherworldly translucent pools of turquoise at the Kuang Si Falls. Water behaved as I’d never seen it, draping like silk over the cascades. At the end of this path, an enormous waterfall so shockingly beautiful it moved me to tears. Laos is somewhere that still has places like this. Places whose beauty catch you off guard. At our Airbnb, a shy teenage girl who’d been separated from her twin sister after misfortune befell the family. Twins are considered to bring bad luck. She didn’t know where her sister was, only that she was somewhere cold. She and her sister had slept in the same bed for their entire lives. I bought her a pink silk scarf from the market. I hoped it would make her feel a little less alone that night. This is a country where some children have very hard lives. 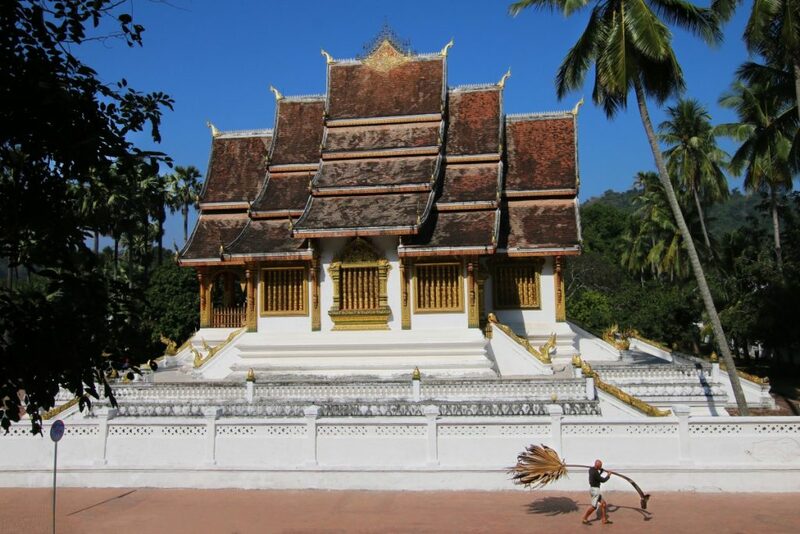 An early morning visit to Luang Prabang’s Wat Xieng Thong temple. 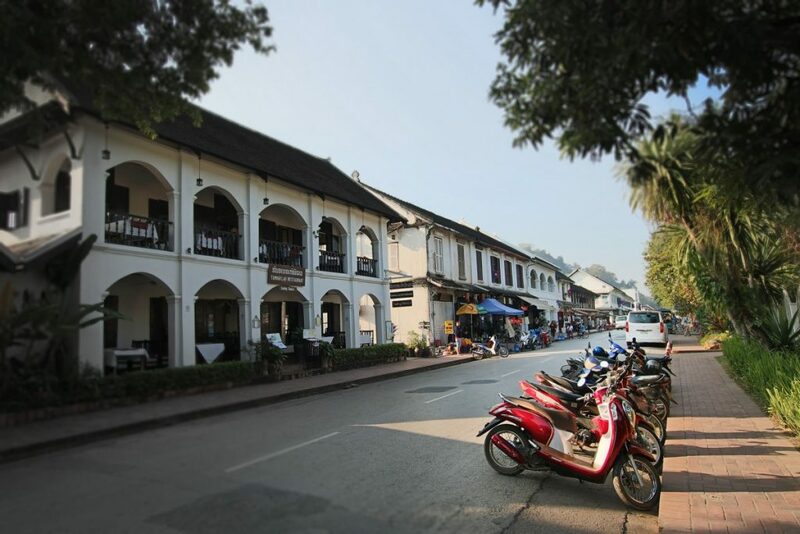 The sleepy streets of UNESCO world heritage Luang Prabang. Luang Prabang schoolkids dressed in traditional outfits at a school graduation. 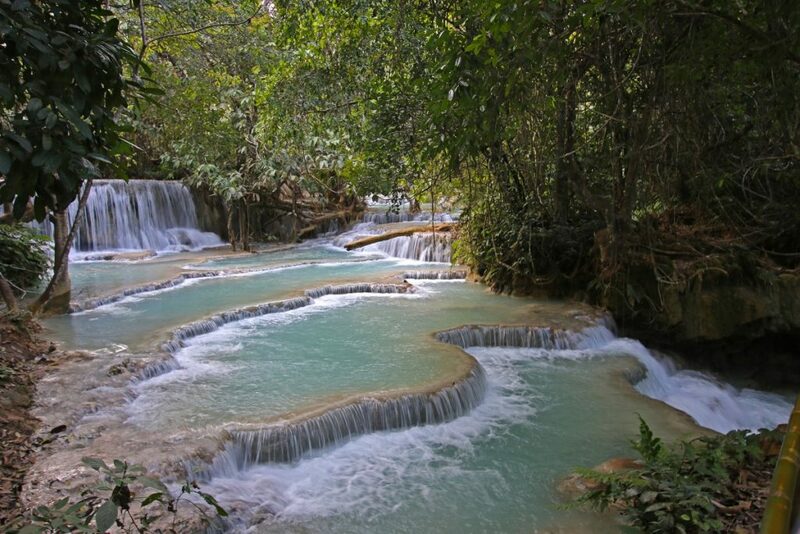 The turquoise pools of Kuang Si Falls. The main falls at Kuang Si Falls. The road from Luang Prabang to the capital of Vientiane zig zags dizzily through hazy mountainsides, where the road drops off thousands of feet. 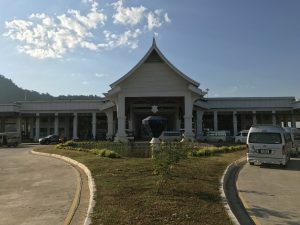 I got carsick just looking at the twisty road on Google maps, and decided to rent a pickup truck for the drive from Luang Prabang to Vientiane. Later, other travelers told us we’d made the right decision: the bus on this route is apparently a nauseous and nerve-wracking affair. 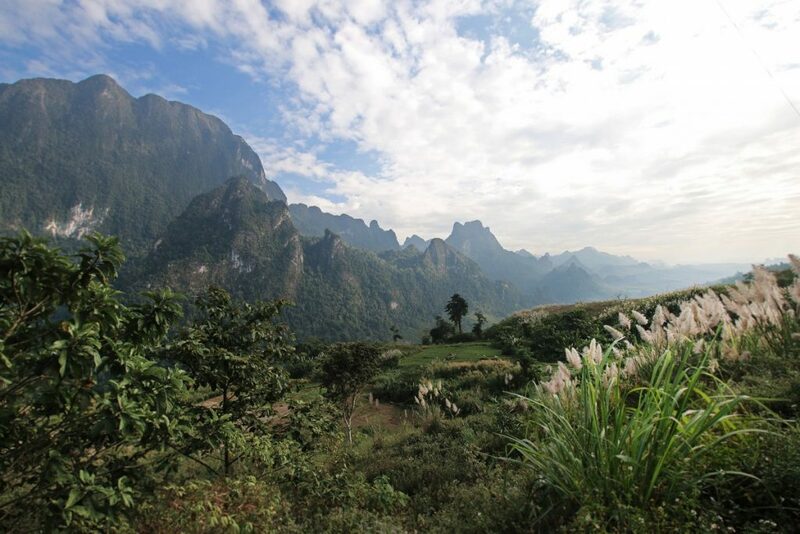 Laos is often described as untouched, forgotten. 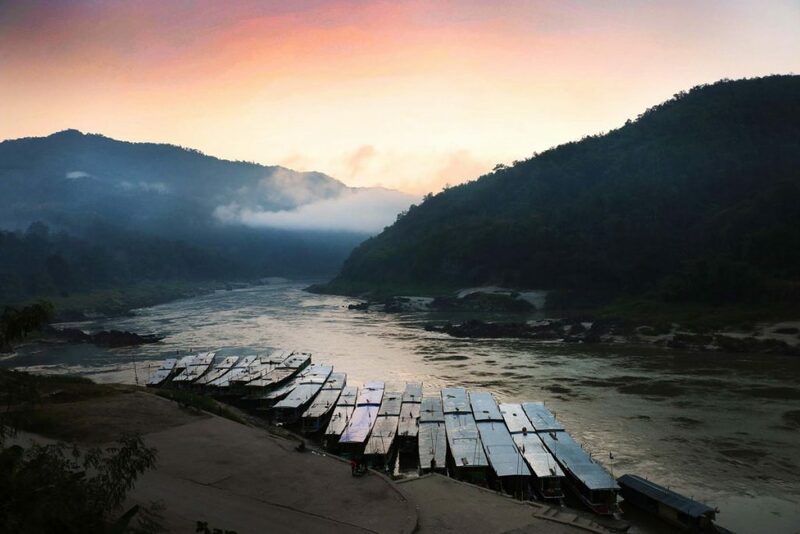 But the mountains look more secluded than they are, with slopes denuded for lumber and temporary cities set up for Chinese-run hydroelectric projects. The road from Luang Prabang to Vientiane is lined with villages, where vendors sell piles of oranges and mangoes and bananas to passing trucks. 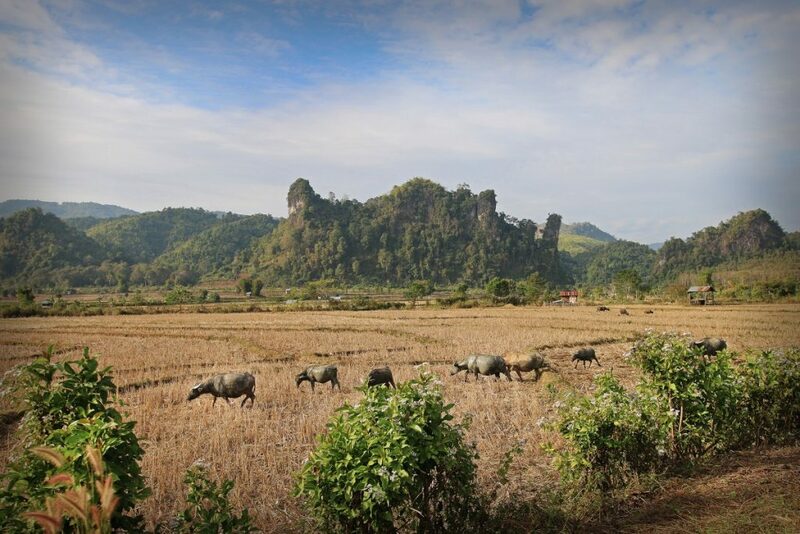 As we approached Vang Vieng, a town known for its river rafting and drunken backpacker scene, the landscape straightened out, with lush limestone karst formations jutting out of flat rice paddies, brittle and brown in the dry season. 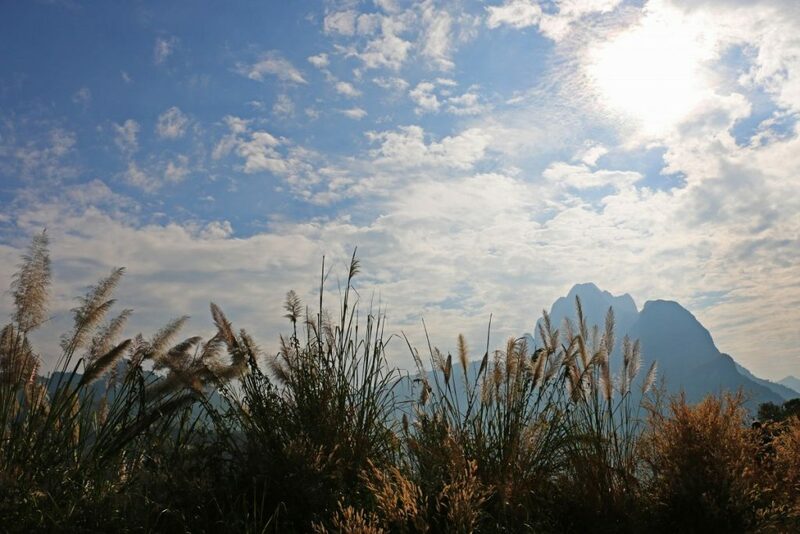 When we arrived in Vang Vieng that evening, our Lao hosts invited us to their family’s New Years celebration. We celebrated over shared stories and cans of Heineken and plates of spring rolls. Another year had arrived. The next day, we followed the road from Luang Prabang to Vientiane. On the drive through the mountains from Luang Prabang to Vientiane, Laos. 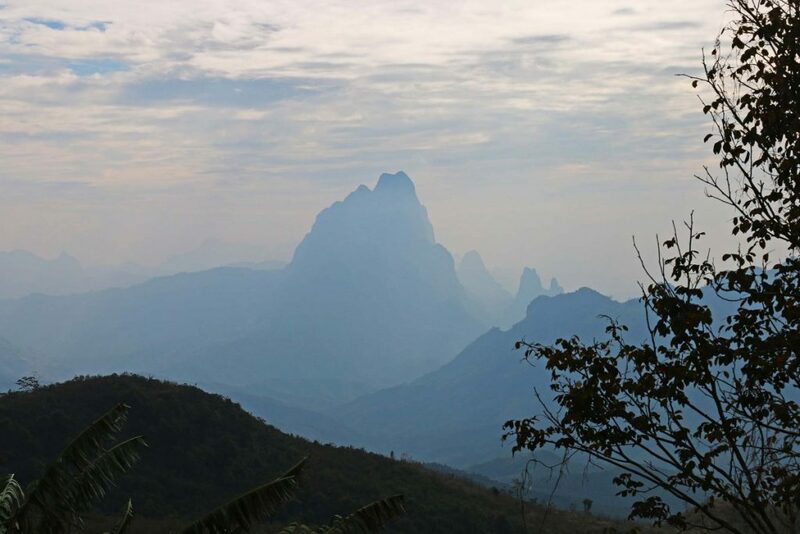 A beautiful mountain landscape, Laos. A mountain valley on the drive from Luang Prabang to Vientiane. Village life in a dry rice paddy near Vang Vieng. Vientiane may be Laos’ largest city, but it’s got to be one of the sleepiest capitals in the world. When we arrived on New Year’s Day, it was so still it almost felt abandoned. Streets are still unpaved near the center of town and wide, European-style boulevards conduct mercifully light traffic. It’s nothing like the other sprawling, congested Southeast Asian capitals like Bangkok. 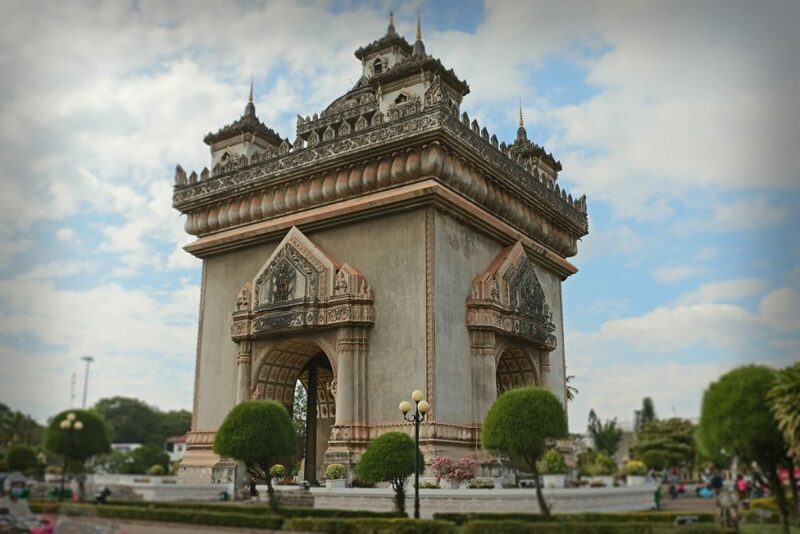 Vientiane, though, is a capital city that heralds its political power in monumental architecture. The scale of these constructions is way off, though. Vientiane is a city of only about 750,000 people in a country of under 7 million, but it must have administrative and government buildings for at least triple that population. I’ve seen architecture like this in post-Soviet countries: the scale is testament to either grandiosity or graft. Some people are getting very rich here: Toyota Highlanders and BMW SUVs roar past bicycles and mopeds and new mansions with shanties for the servants outside their front gates line the riverfront. The only skyscraper to speak of is the private residence of a Chinese billionaire investor. Luckily, the rest of Laos isn’t like this. The best thing we did in Vientiane was visiting the Cope Visitor Center, a museum about landmines in Laos, where we learned about the Secret War, when Laos became the most heavily bombed country in the world. We enjoyed Vientiane’s cafe culture, sipping ridiculously sweet Lao coffee for an afternoon pick-me-up, and Lao Kitchen for traditional dishes (larb, made with or without pig’s blood, Luang Prabang sausage, Mekong fish). As much as I love Laos, when we left Vientiane, I knew I would never come back to this city. We took an overnight sleeper bus from Vientiane to Pakse in the south. The sleeper cabin was a metal coffin captained by a madman barreling down the road and swerving spastically to avoid hitting or being hit by other cars. For 10 hours. When we arrived in Pakse, I stumbled off the bus into the sun, dazed to still be alive. Patuxai, a landmark and war memorial in downtown Vientiane. An example of the monumental Soviet-esque architecture in Vientiane. 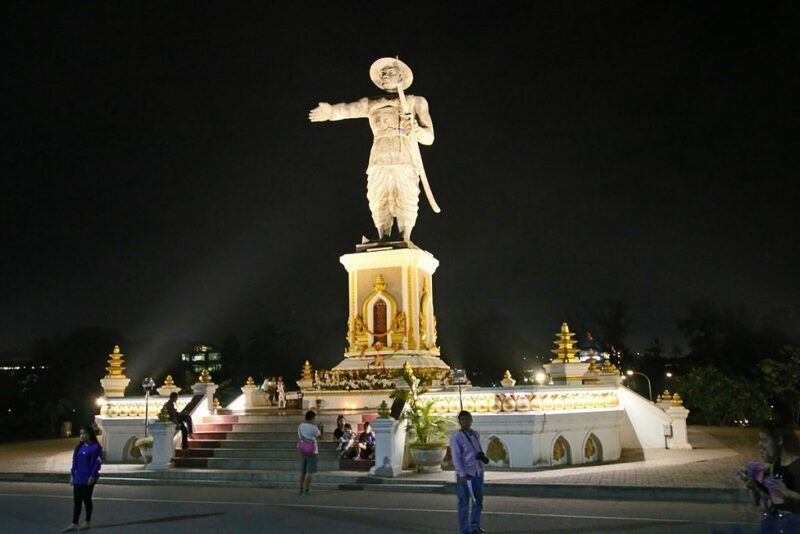 Pakse is the regional capital in southern Laos, and the jumping off point for travel to the Bolaven Plateau (to the east) and 4000 Islands (further south). 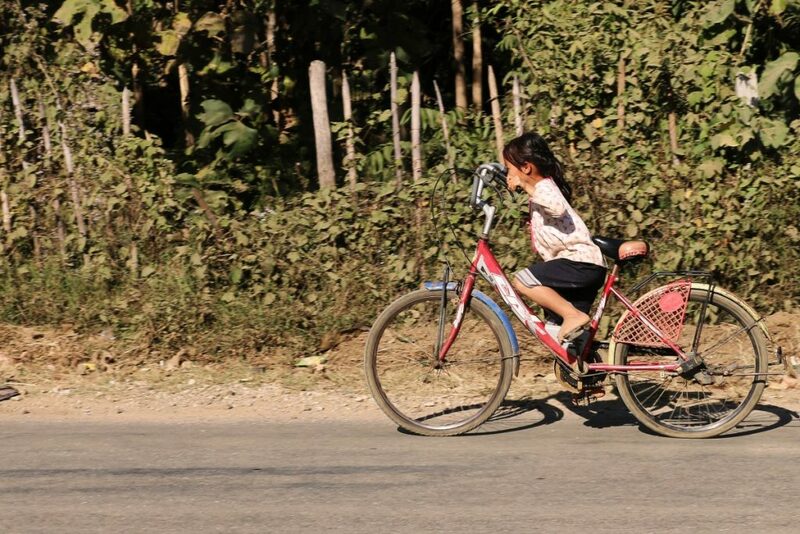 Driving the Bolaven Plateau motorbike loop was one of the best things I did in Laos. 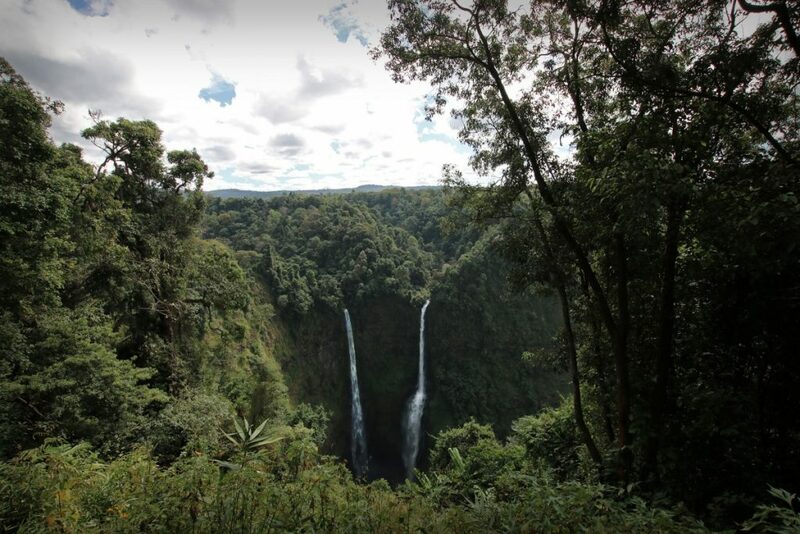 The Bolaven Plateau is a mysterious high plain of jungle canopies and plunging waterfalls and traditional villages and the best coffee in Laos. 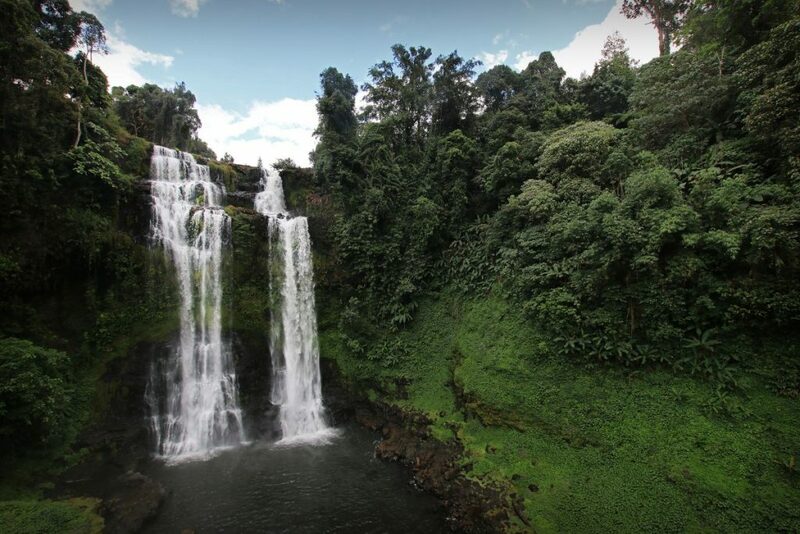 Tad Fane, the most beautiful waterfall on the Bolaven Plateau motorbike loop. Tad Yuang waterfall, another beautiful stop on the Bolaven Plateau motorbike loop. 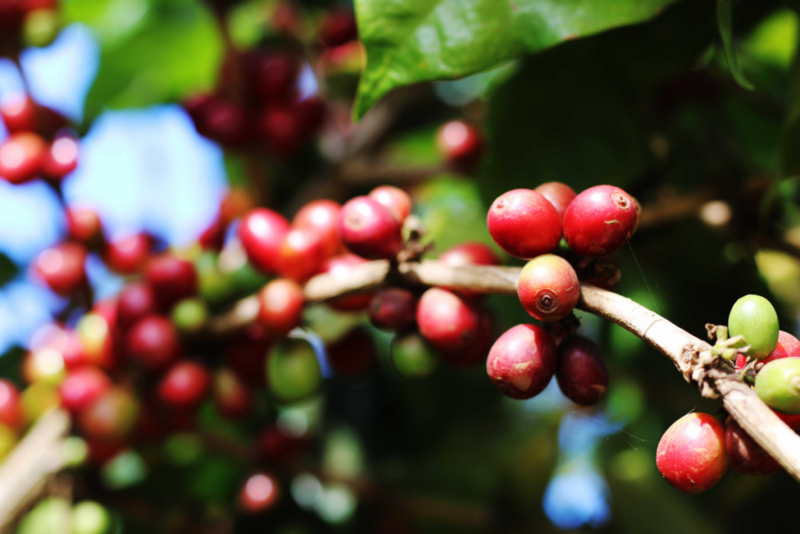 Some of the best coffee in Laos comes from the Bolaven Plateau. A Laotian bayou at the end of the road. 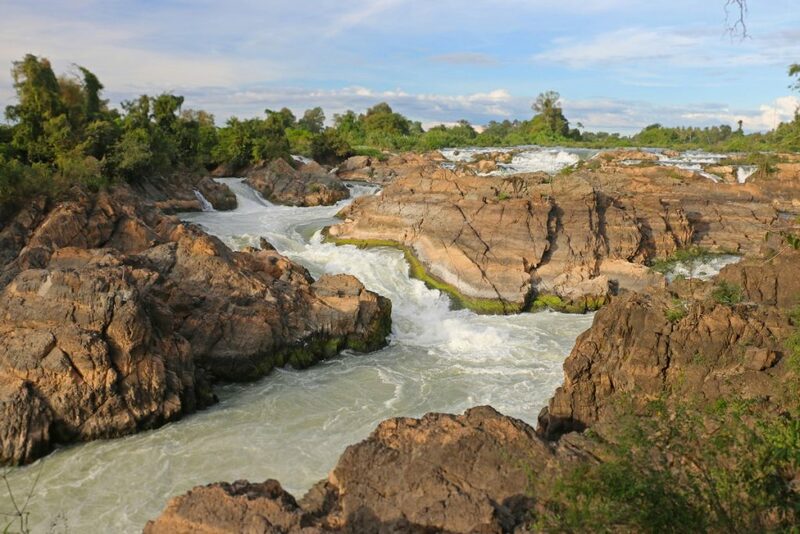 The 4000 Islands/Si Phan Don is a group of river islands in the Mekong at the very southern end of Laos. 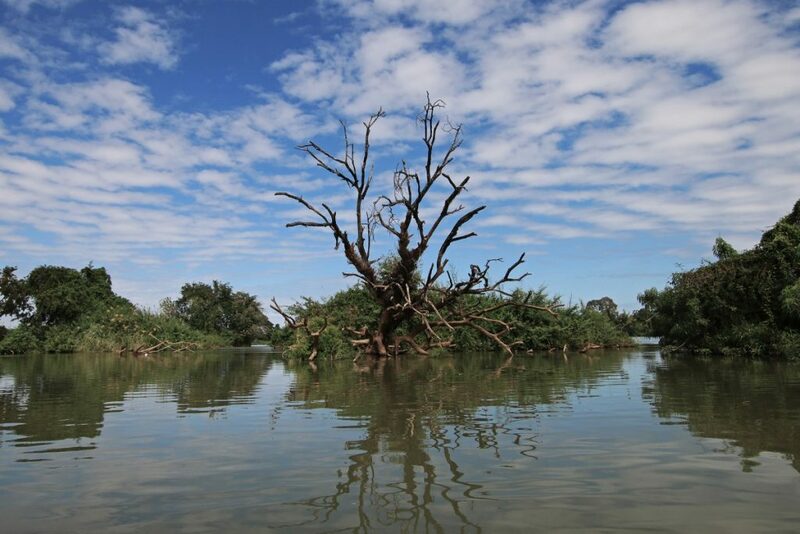 The name has got to be a rough estimate: the island count is constantly changing with the rainfall and variable water level of the Mekong. But the name “4000 Islands” sounds to me like one of those optimistic names early European explorers gave to the places they discovered, where everything seemed so abundant and promising. There’s actually really only two main islands in the 4000 Islands where people stay: Don Dhet, catering to the backpacker-stoner crowd, and Don Khon, a quiet island connected to Don Dhet by an old French railway bridge. We stayed on Don Khon. Laos is a mellow country, and the 4000 Islands make other places in Laos look hectic in comparison. There’s not much to do here, and that’s the draw. We spent most of our time on Don Khong laying on hammocks on the porch of our bungalow overlooking the Mekong. We’d take a bike ride, take a nap. Watch the sun go down over the river before heading out for a simple meal. The big attraction on Dong Khon is (another) amazing waterfall called Li Phi. Located about 2 km west of town, the Li Phi waterfalls are an easy walk or bike ride. 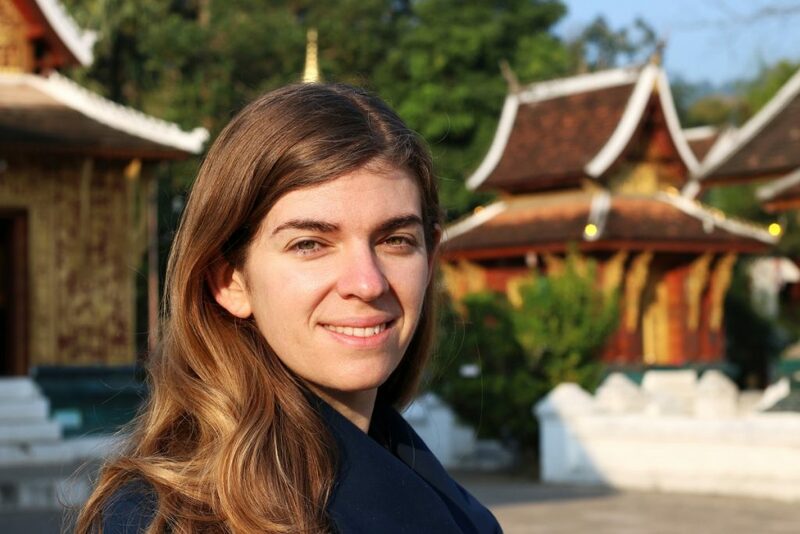 When I went, I didn’t have any idea of what to expect, and well, Laos surprised me again. The Li Phi falls rush in churning torrents over enormous boulder-mountains, carving out canyons striated with colors marking the rising and falling water levels of the falls. The water frothed in angry rapids and raced by at a startling pace. Things were so peaceful just up the river, where the river lazes by without a care. This contrast allows the canyons of the Li Phi falls make their appearance all the more dramatically. The most crowded bus I’d ever been on, from the 4000 Islands to Pakse. downstream of the Li Phi falls (Cambodia or Vietnam). The French tried to circumvent this problem by building that railroad that would “ferry” goods by land from one side of the falls to the other. The idea was doomed to fail for geopolitical reasons – the French colonizers were eventually kicked out – and now the railway bridge between Don Dhet and Don Khon is another reminder of big plans that never came to be. 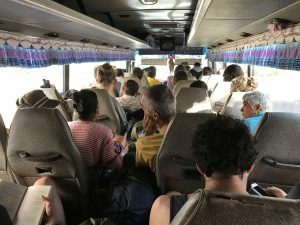 After a few restorative days in the 4000 Islands/Si Phan Don, we traveled back to Pakse on the most overcrowded bus I’d ever been on, and flew to Siem Reap, Cambodia, where our Cambodian adventure began. The 4000 Islands/Si Phan Don is a laid-back Laotian mangrove-bayou. The French railroad bridge connecting Don Dhet and Don Khon in the 4000 Islands/Si Phan Don. 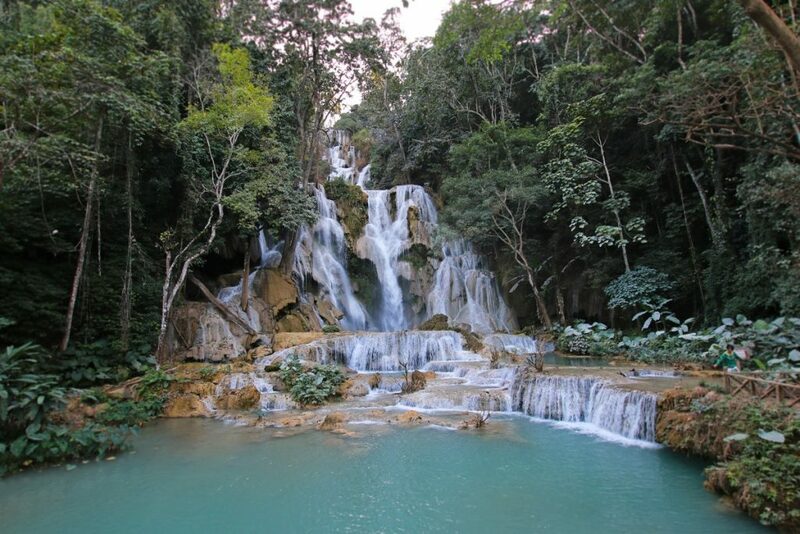 The impressive Li Phi falls on the island of Don Khon. 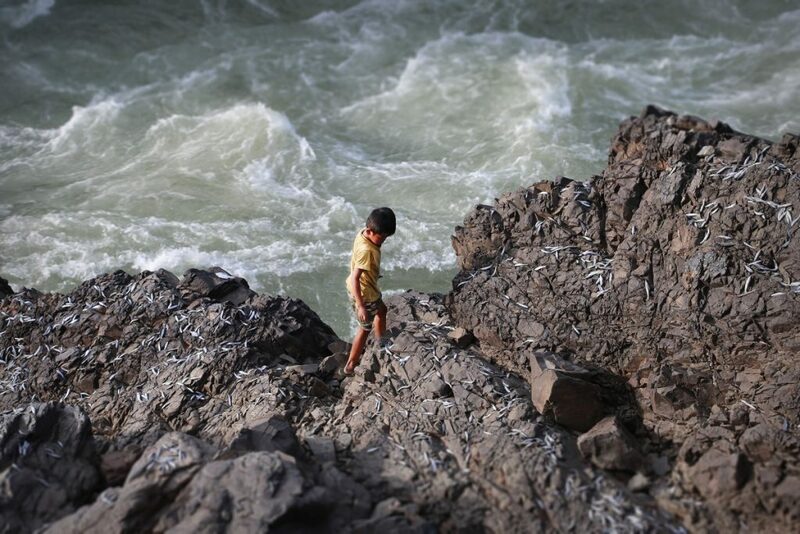 A boy laying fish out to dry in the sun above the rapids of Li Phi falls, Don Khon. 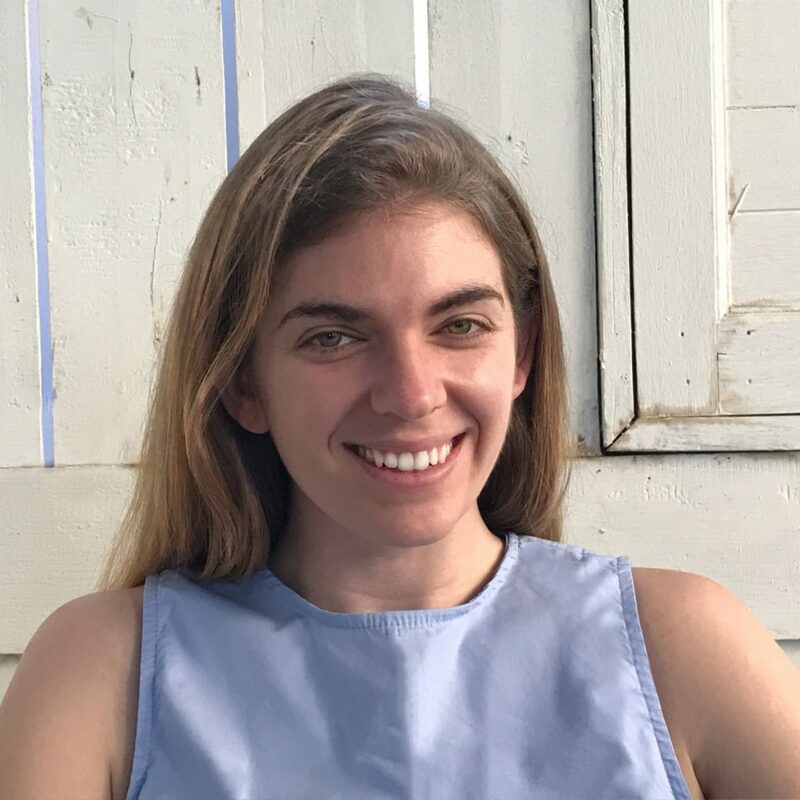 Hi Alicja, thanks for your comment! In Luang Prabang, we rented from AVR Laos (http://www.avrlaos.com/). They do one-way rentals to several destinations throughout the country. They weren’t cheap but the car was in perfect condition and the rental was easy. Hope you have a great trip!